More and more Veterans are going the route of self-employment. They pull their personal resources together and strike out for better or worse. Often times, it's for better. There is one publication you want to check out. It's called Vetrepreneur. For a whoppng $3.99 per month, you can subscribe to this magazine and learn what is going on in your state and around the country. This publication is issued by the National Veteran-Owned Business Association. Contact Courtney Miller at cs@navoba.com for membership information. donations that would sponsor Veterans. Veterans Business Training". But much work remains. Don't delay. Voting ends soon! High unemployment is wreaking havoc for Veterans moreso than the with the general work force. There will be many coming home and the employment picture is kind of a mess. There is another hitch that is messing up the job market. Baby Boomers were supposed to be retiring in hordes, opening up jobs for those entering the job arena. This isn't happening. Many retirees are, and will be, working into their 70s. Many can't afford to stop working. Others just like to keep busy. You also will want to visit http://www.buyveteran.com where you can find Veteran-Owned businesses. Make it a point to "shop Veteran" every chance you get. Veterans often develop important skills that can be transfered to civilian life. Even the guy or gal out there in the thick of battle creates skills - skills of being resourceful, being alert, learning to take action when the options are unclear or uncertain and when fear starts to take over. I was lucky during my Army stint during Viet Nam. I did not see battle; I did not even go to Viet Nam. Instead I went to Naval Justice School and then worked in California within the legal system. I was lucky. My new skill I learned was to prepare a database of soldiers who were apprehended for going AWOL or for some other infraction. My database was a manual one; there were no personal computers in that time. With just a bunch of 4 x 6 cards and a file box, I could enter information on every soldier - were they incarcerated or in pre-confinement? did they have their initial meeting with the defense attorney? were they able to view the documentation and charges against them? how many days of AWOL had they accumulated? how far along in the process of courts-martial were they? And so on. This was my database and when Col. Jenkins called me to ask the status of a certain soldier, I could give him a detailed report in about 15 seconds. I still use databases. In fact, in my freight broker training, I emphasize building databases of shippers and motor carriers. Believe me - these databases are a freight brokers' gold mine. Build them, nurture them and use them. What Would We Have Without Our Veterans? I have started a program which I hope will grow. The demand is there - it's just a matter of getting organized to deliver the service. But, it will take time to grow this. 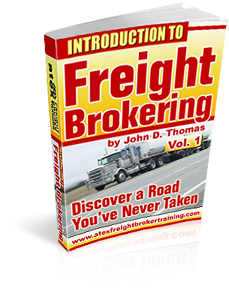 Next week I will be announcing my selection for freight broker training. And it's free. Applications are closed as of yesterday for the October training. Applications will be taken until November 20 for the December training. If you have already submitted an application, there is no need to do it again.